AMERICAN FORK, UT--(Marketwired - January 04, 2016) - Studies show that the health supplement L-arginine Plus® could have positive benefits on cardiovascular health, due to the effects on the body's blood flow. This conclusion could revolutionize the way the medical community approaches the treatment and prevention of heart disease. L-arginine, a semi-essential amino acid, is converted by the body into the chemical compound Nitric Oxide (NO) which has the ability of causing the blood vessels to relax and widen. This safely and naturally improves circulation and can have positive impacts on a host of common cardiovascular issues such as high blood pressure and coronary artery disease. The enhanced blood flow can also be beneficial for other medical conditions related to poor circulation such as dementia, erectile dysfunction, and poor kidney function. As plaque forms along artery walls, hardening and narrowing the arteries, it becomes increasingly difficult for blood to flow easily through the body. The body's capacity for circulating nourishment and oxygenated blood to all vital organs decreases, thus raising the risk for heart attack and stroke, as well as a multitude of other health problems. Proper supplementation is key for effectively improving circulation and experiencing significant benefits. L-arginine Plus® combines L-arginine with other nutrients including amino acid L-citrulline, B vitamins, vitamin C, magnesium, red wine extract, and folic acid. Studies indicate that oral supplementation of these ingredients may reduce the risk factors and symptoms associated with coronary heart disease, such as high blood pressure and atherosclerosis. The effects were shown to be most profound on individuals who were experiencing the early stages of heart disease, where many aspects of the disease are still reversible. Using L-arginine Plus® as part of a healthy diet demonstrated to not only enhance blood flow through vasodilation, but also to decrease blood viscosity. These findings are promising for the grand challenges that the medical and scientific community faces in combating one of the developed world's most pressing health crises. Heart disease, specifically coronary heart disease, continues to be the leading cause of death in America, among both men and women. The ingredients in L-arginine Plus® were also shown to correlate with the reduction of stroke, the fourth leading cause of death in America. Where a heart attack occurs when a blood clot obstructs the flow of nutrient and oxygen-rich blood to the heart; with a stroke, blood flow to the brain is blocked. 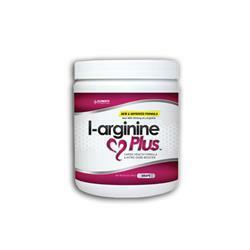 It has been found that stroke victims tend to have low levels of L-arginine and nitric oxide in the bloodstream. Increasing vasodilation and reducing risk factors such as high blood pressure and high cholesterol levels demonstrated a positive correlation between the effects of this amino acid and stroke prevention. The amino acid L-arginine is found naturally in a variety of foods such as chicken, fish, and dairy products. Raising its levels through oral supplementation has been shown in clinical trials to improve blood flow and to promote a cascading effect of cardiovascular health benefits that are not seen without use of the supplement. L-arginine Plus® has the effect of replacing the levels of L-arginine in the blood stream lost through normal metabolic functioning. There are no known negative side effects of adding the formula to the diet. L-arginine Plus® powder was inspired by the work of the 1998 Nobel Prize winning scientist and author of "No More Heart Disease", Dr. Louis Ignarro. This Cardio Health Formula is a unique supplement that provides consumers an affordable and effective option for improving well-being and living a healthier lifestyle at a reasonable cost.